ule #1: Colours advance or recede. Bright colours advance and make an area appear larger! Dull & dark colours recede and make an area appear smaller! To make smaller lips appear bigger, use a lighter colour with a gloss or shimmer. To make large lips appear smaller, use a dark matte colour. Wearing black will make you look skinnier and white will exaggerate that particular body part. For example, if I had a stomach and a smaller booty, I’d be wearing a black shirt and white pants. Ok.. listen… just because you have blue eyes and want to make your eyes pop even MORE… it doesn’t mean you gotta use blue eyeshadow.. you could opt for a purple eyeshadow [for true-blue eyes]. 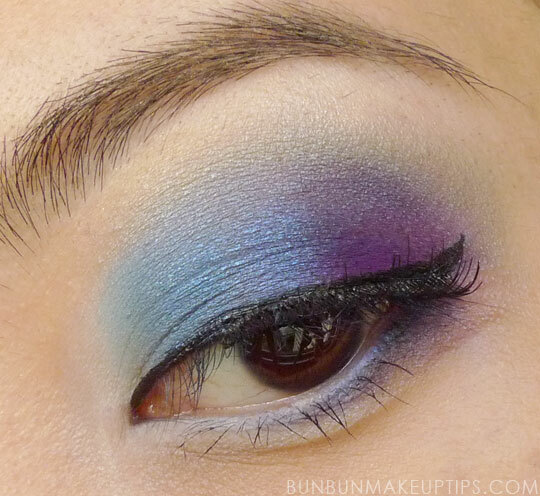 However, if you STILL prefer blue eyeshadow, remember to use a light shade of blue. Because if you place a brighter blue next to a pale blue, the bright blue will definitely be the centre of attention, therefore will steal away the blue of your eyes instead of doing the opposite! Boo! Okay, so some colours DO reflect other colours better than stealing it. Saying this, if you happen to have acne or any red scars or skin conditions which causes redness, wearing a warm colour of clothing WILL reflect the redness in your skin. A red lipstick with cool tone will make your yellow teeth appear whiter. Whereas, if you wear a red lipstick with a warm-tone based, your teeth will appear even more yellow. Boo! A yellow shirt, even though not red, can make you appear more pink if you happen to have acne scars or couperose skin or even, a pinky complexion. Now.. we can’t have a condition or anything which gives us a green-ness or blue-ness, unless it’s bruises or dark-circles [still consider it please!]. If you have extreme dark circles, black eyeliner or eyeshadow on your bottom lash line should be avoided because this will make an emphasis on dark circles! Boo! Paleness with a green tone… wearing blue, green or purple can make you look paler. So do opt for something with a warmer undertone. Dull colours will absorb more light than bright, shiny colours. Eg. 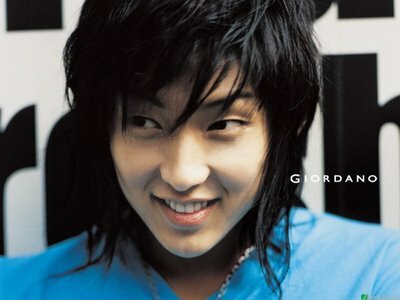 If your hair is rough and greasy, it should appear darker than it really is. ^^ Ok, this rule, I don’t understand LOL Someone please explain. That is all for today’s lesson! Thanks for reading guys! Hope this post helps you guys ALOT, because it DID help me LOL 😀 at least I know not to wear warm colours when I don’t conceal my redness! Yey! Tsk! These were some of those that made me confused! The people who named their images must have been confused too. And because I incorrectly used the term ‘Horizontal Gradient’ for my previous tutorial, my pictures appeared under the keyword search too. The 2 bottom images are really sneaky! They have BOTH horizontal AND vertical gradients! Take a look at the bottom left one. 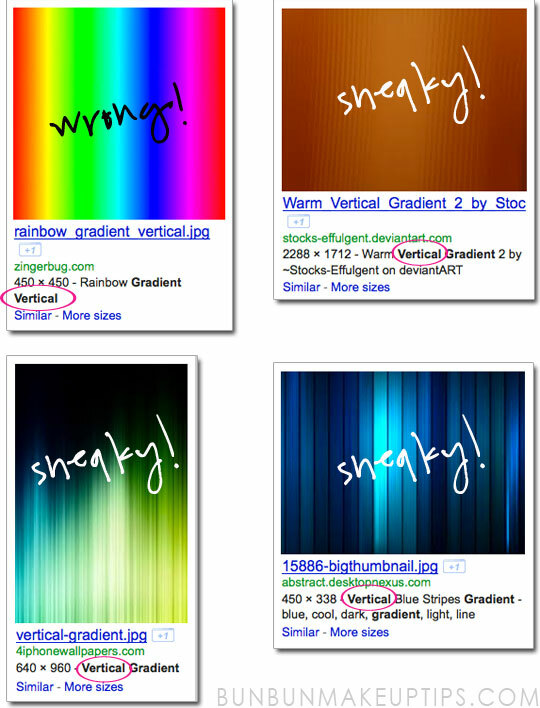 At that time, only the horizontal gradient was obvious to me – left (blue) to right (green) – and since the caption used ‘vertical’, I thought left to right gradient meant vertical gradient! Same goes for the bottom right image – dark to light blue stripes were described as ‘vertical’. These findings were against all my understandings of horizontal vs vertical lines, yet I chose to abandon them and trusted the wrong captions. GAH!!! There had always been a nagging feeling that I got the terms wrong but couldn’t find enough information to justify that gut feel, which I really should’ve trusted instead. Then a few days ago, there was a sudden spark of wanting to ‘get it right once and for all’. 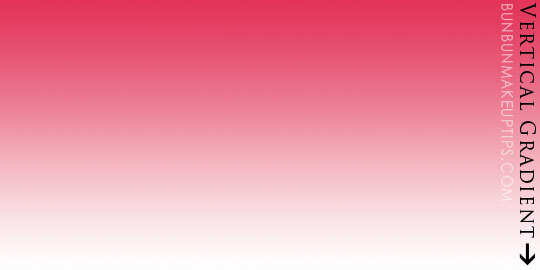 So I launched my CS4, selected Gradient Tool, dragged the line horizontally, and got my correct ‘Horizontal Gradient’. It probably doesn’t mean much to you – horizontal, vertical, whatever – but I’m particular about labeling and if I don’t change it now, before Part 5 of the Asian Eyeshadow Tutorial series is published, there will be more confusion in later years. Also, since I was the one who coined the terms ‘Vertical Gradient Eyeshadow Application Method’ and ‘Horizontal Gradient Eyeshadow Application Method’, I deem it necessary to right the wrong. 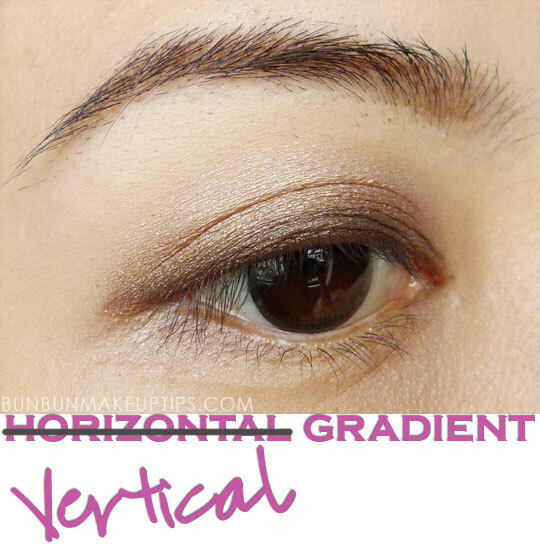 So… Hop over to the ‘old’ Horizontal Gradient Eyeshadow post and you’ll see that I’ve changed all the ‘horizontal’ words to ‘vertical’. My deepest apologies (and great thanks!) to those who’ve talked about that post on their blogs. 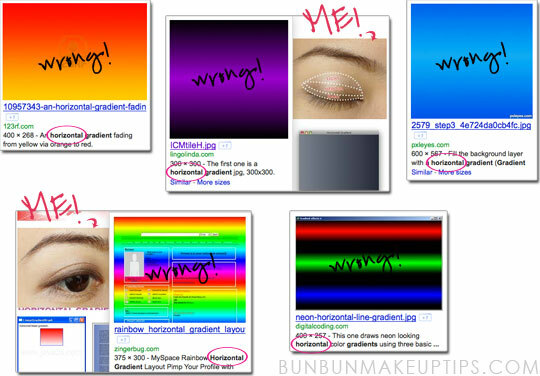 The link will remain ashttp://bunbunmakeuptips.com/eyeshadow-tutorials-for-asian-eyes-part-2-horizontal-gradient-method/, so don’t worry that it will be linked to a “HTTP Error 404 – File or Directory not found” page. Lol. But fret not, those who are single lidded or have hooded lids! I have seen people with such eye shapes do well with the Horizontal Gradient Method, you just have to bring the colors ABOVE the fold (hooded) or stop under the Socket Line(mono). Proceed to blend out the edges with either a clean brush if you want to leave it at that, or a color for the Contour Area. I prefer the latter because I always prefer to define my eye Contour Area to warm the face and add depth to my eyes. I used NYX Mermaid (from Amazon), a good dupe for MAC Humid. Blend with MAC 217. Get your liner on! And don’t forget to Tightline! I was so glad to have been able to use up my white eyelash glue for myHalloween 2011 Geisha look. And you’re done! JANG JANG!!! Ohmygawd, we’re done with the 5 episodes of the Asian Eyeshadow Tutorial series! Can’t believe it! Now that all that Halloween dust has settled, it’s time to return to the Eyeshadow Tutorial for Asian Eyes series! 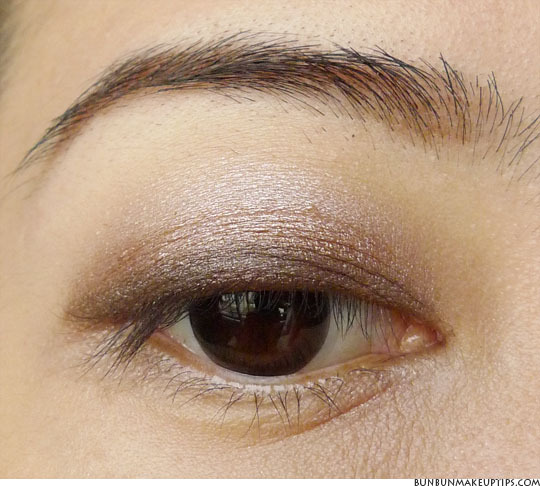 In the third installment of the Eyeshadow Tutorial for Asian Eyes series, we discuss the Outer V.
Oooh, the MYSTERIOUS Outer-V. That tiny area that has eluded even the best of us. Before we continue, why not check out the other parts of this series first? Where is the Outer V? 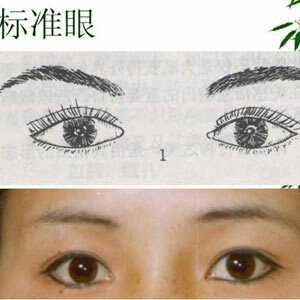 As with the Crease and Contour Area, the Outer-V on the Asian eye is quite different from that on the Caucasian eye. It took me a while to discover this as well. 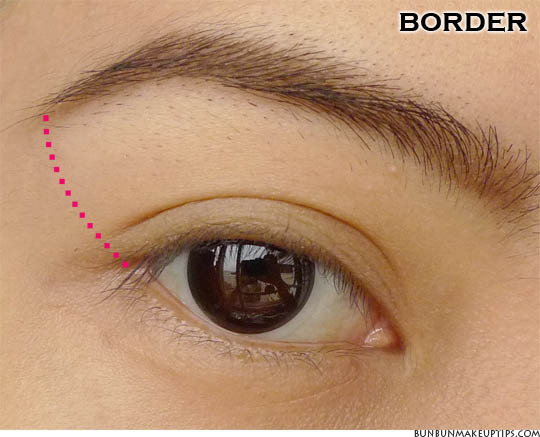 1st stroke of ‘V’: Imagine a line that extends beyond the Lower Lash Line, draw the line towards the brow, careful not to extend beyond the Border. 2nd stroke of ‘V’: Connect with the Crease. Marlena from MakeupGeek has a great video on the Outer V for Caucasian eyes. I look like a drag queen when I use that method. Lol. 2nd stroke of ‘V’: Blend towards the Contour Area (aka Orbital Rim or Socket Line), which is above the Fold. 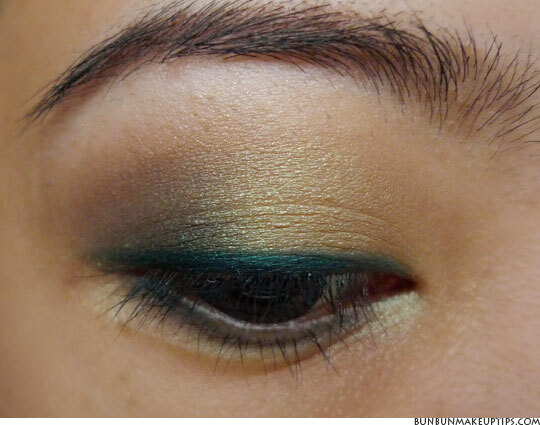 For other parts of the eye, check out Part 1 of the Eyeshadow Tutorial for Asian Eyes series. Bun Bun’s Makeup Tip: Be careful not to draw too sharp or dark an Outer V on the Asian eye, because it may look especially stark without the natural indentation of the eye. Also don’t bring the Outer-V too much inwards, stop somewhere before reaching the middle of the lid. How to Define the Outer V? I’ve found that what works best for me is to only perform the Outer V on a very small area at the outer part of the eye. Like a super small ‘V’. I’ll definitely work colors onto the Contour Area first, then add the tiny ‘V’ on top of that. I normally get on with the Lid colors first then proceed to defining the Outer V.
I primed my Lid with Urban Decay Primer Potion in Eden, and pat on NYX Single Eyeshadow in Rust, bringing it above the Fold. I used MAC 239 Shader Brush. 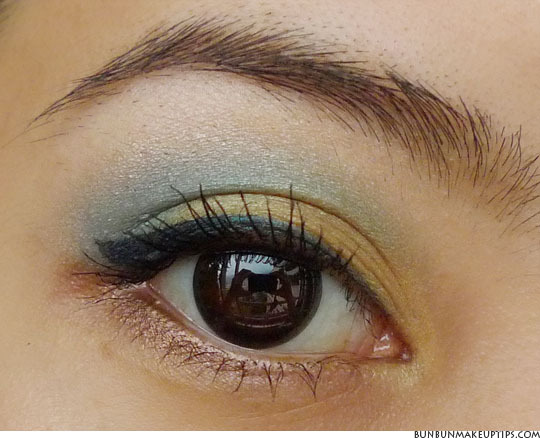 Apply NYX Single Eyeshadow in Mermaid Green to the Contour Area. Here I used Stage’s Shadow Smudger. It really doesn’t matter, sometimes I simply use the flip side of MAC 239 too. This is how the colors look without any blending. Chunky, isn’t it? Blend out the edges with a clean blending brush, like the MAC 217 Blending Brush. Looks better. If you think too much of the Contour Area color has been lost, you can always add it back and repeat the blending. To get to the Outer V, use a pencil brush like the MAC 219, or Essence of Beauty Duo Brushes, or any brush that has a pointed tip since it is such a small area that requires precision. I used Urban Decay Naked Palette‘s Darkhorse. 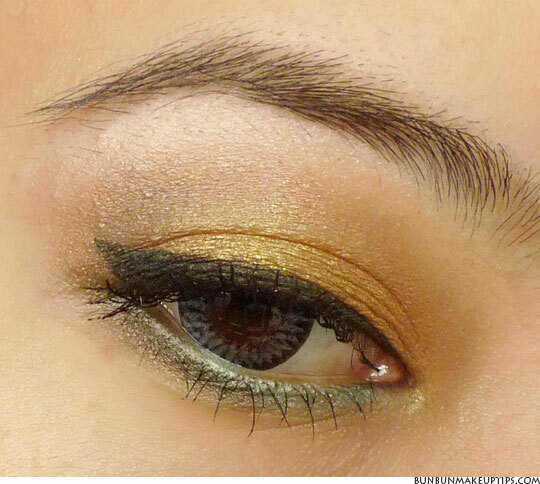 I love using Darkhorse on theOuter V. It is a very dark brown-grey with gold shimmer. And that’s the 1st stroke of ‘V’! The 2nd stroke of ‘V’ is trickier. 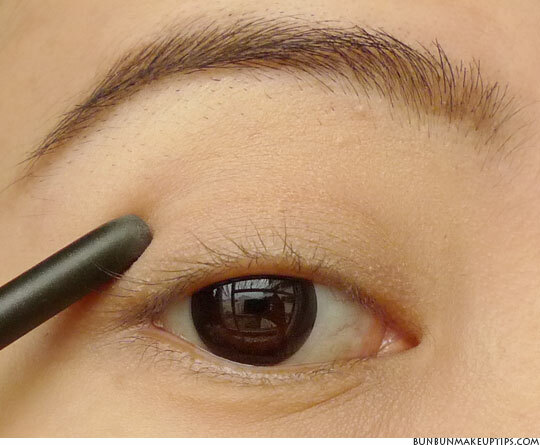 The same way as I mentioned in all my eye makeup tutorials, like this one here, gently push the brush back into the skin to locate the Socket Line/Orbital Rim. Following the guidelines stated earlier, after placing color on the Outer V, you will want to feather out the harsh edges of the Outer V strokes, and also blend the color nicely into the Lid colors. Use a clean brush blending to diffuse the Outer V color, or have the same color on the brush (Darkhorse) to strengthen and then blend it out. The Outer V really does bring more dimension to the eye, yea? Bun Bun’s Makeup Tip: Don’t carry the upper stroke too far into the eye if you have smaller eyes as doing so can potentially make the eyes look smaller. To finish the look, highlight the Brow Bone, add some color on the Lower Lash Line, line and tightline (What is Tightlining?) your eyes, and add mascara to your lashes. Why Define the Outer V? There are several reasons why people define the Outer V.
1. Adding a darker color to the outer edges of the eye in the shape of a V adds a lot more dimension to the eye. Even with just that tiny bit of definition at the outer corner – which is what I do – brings a whole new depth to the eye makeup look. You can also use colors such as purple, blue, brown, instead of black. Black is very harsh and not entirely suitable for eyes that are not ‘strong enough’ to hold the weight of harsh black. It can totally make your eyes disappear. 2. Defining the Outer V enables one to correct the eye shape or make the eyes look nearer or further apart. 3. 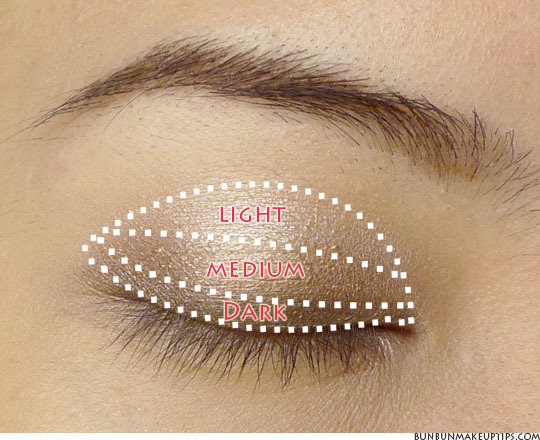 Having a dark color at the Outer V helps to hide or correct some errors made from applying eyeshadow. Bun Bun’s Makeup Tip: The difference between the Outer Vand Upper Outer 1/3 of the Lid is that the Outer V can be large or small, and extends inwards, while the Upper Outer 1/3 of the Lid just stays within that 1/3 of its space. Should I Or Should I Not Draw The Outer V? 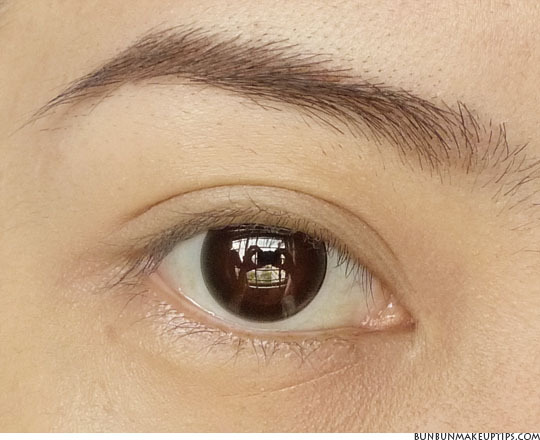 My eyes are larger than the average Asian eye, I have prominent double lids, and not-as-heavily-hooded lids that show some lid space beneath the Fold when my eyes are open. My Orbital Rim and Fold don’t meet, but the gap is not too big because of my thicker double eyelids. Despite having those on my Asian eye, placing a dark color on my Outer V using the Caucasian way requires a lot of blending and blending and blending so that the Caucasian Outer V placement would not look odd and fake on my Asian eye. Thus, I would suggest that people with monolids or heavily hooded lids stay away from dark, harsh colors on the Outer V, unless you are very confident with your blending skills. What I do is, instead of trying to emphasize the lack of a crease or the presence of a hooded lid, I work on the Contour Area with colors. Find colors that look good on your skintone. 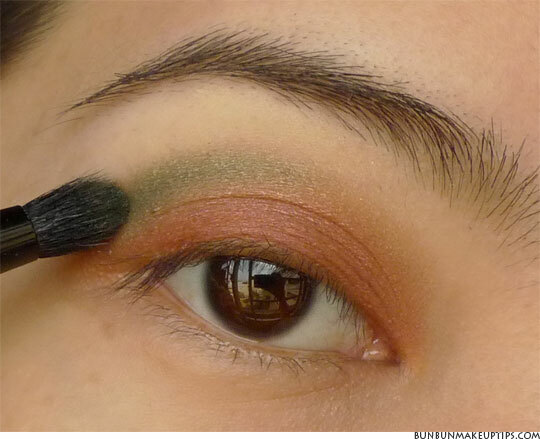 Using colors on the Contour Area and Lid can serve to distract from the lack of a Fold and also brighten up the eye. SEE! No Outer V at all! And Would Recommend It To You Too! Even though I can carry a heavy Outer V look, I prefer not to do it all the time because it requires a lot of blending and time, and my eyes actually look better with a soft Outer V emphasis. It is important to know what works for your eyes, instead of forcing a type of eyeshadow application just because someone else said this or that works for them. 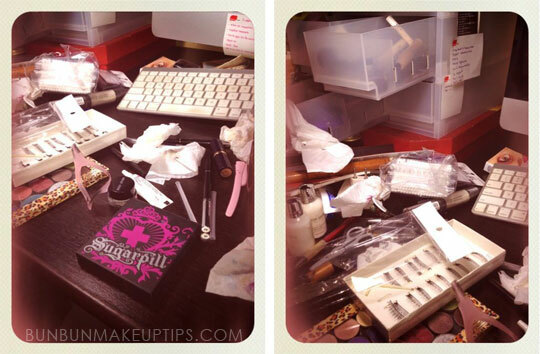 There are no ‘rules’ to makeup. You can and must find what works best for your eyes. You’ve seen how I conquer my Outer V, I use it as an accent instead of creating the whole eye shape with it. The darker color on the edge will create a frame for the eye. That little definition gives an instant accent to the rest of the eye makeup! Don’t have a tutorial for this look. I used Sin, Grifter and Last Call on the Lid and Smog on the Outer V.
All shades are from the Urban Decay Ammo Palette. Okie, I have officially run out of excuses to further delay publishing this. Haha. But it’s not like I was lazy; I simply couldn’t bear to do it because doing it means being one post closer to the end of this series! I’m absurdly sentimental, I know. In the fourth installment of the Eyeshadow Tutorial for Asian Eyes series, we cover Defining the Contour Area. This must be the hardest topic to explain, but I think is very important for me to share because I learnt it the hard way and took a long time to understand theContour Area of the Asian eye. More so because there is a lack of explanation for this ubiquitous area all humans have, but appears very different on the Asian eye and Caucasian eye. This tutorial is not limited just to the Asian eye or Caucasian eye, this can also apply to people of Caucasian descent with hooded eyelids. I use the broad categories of Asian VS Caucasian for simplicity in explanation. Some of you might be very clear about the differences by now from reading my tutorials, but for those new to my blog or aren’t quite certain about the differences yet, let me explain quickly. 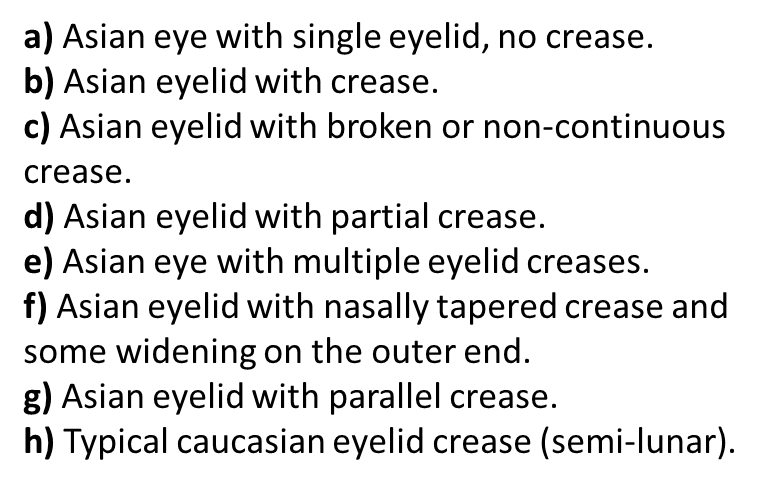 Our Western friends use Crease to describe the Fold, which is where the eyelid folds. Their Crease also coincide with the Orbital Rim. So it is natural for Caucasian makeup gurus to mention in their videos or blogs to ‘place the dark purple color on the Crease’, since these two areas coincide. 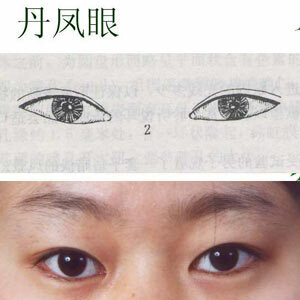 Asians, on the other hand, have their Fold way down below the Orbital Rim. 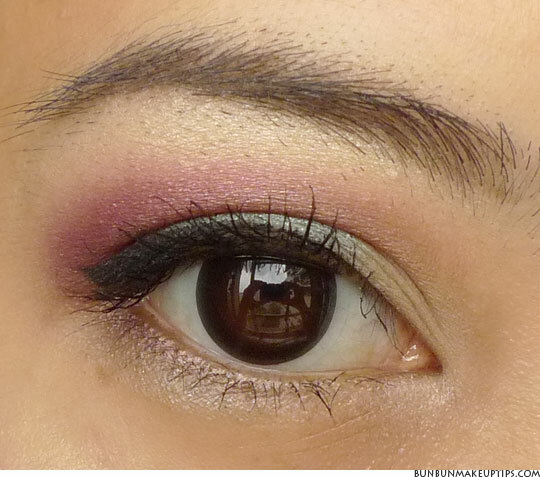 If an Asian were to ‘place the dark purple color on the Crease’, blindly following the tutorial meant for Caucasian eye makeup placement, then the dark purple color will end up in the Fold instead. And this is where many people get frustrated with not being able to achieve a certain look desired. That is why I don’t use Crease to describe anything since it means something to the Caucasian eye but means a totally different thing to the Asian eye. Now, now, don’t get me wrong. 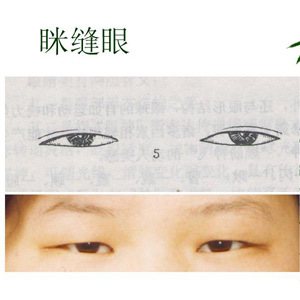 Not all Asian eyes look like that. 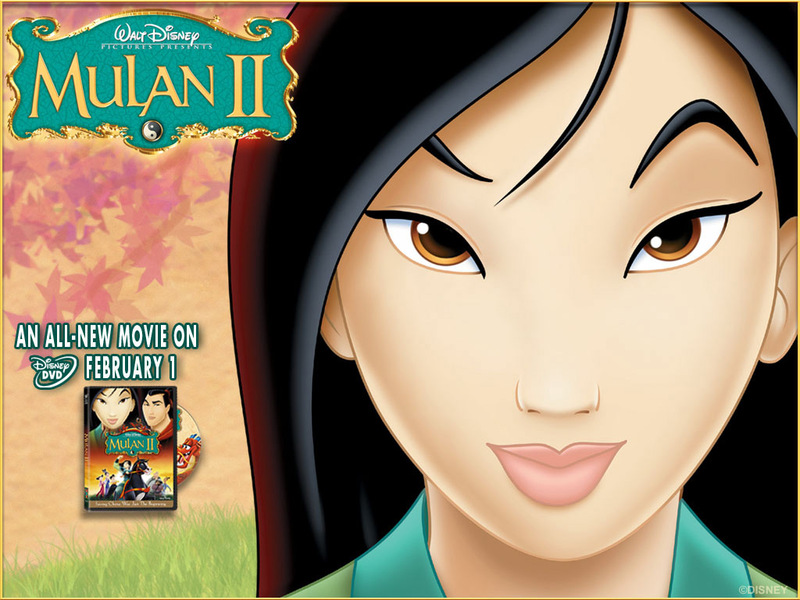 In fact, there is a greater variety of eyes for what we call the ‘Asian eye’, if I must say so myself. 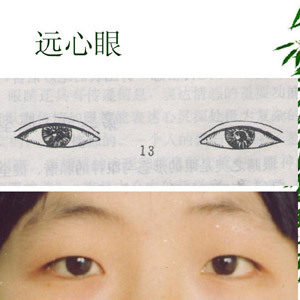 I wrote in a previous post some 14 types of Asian eyes and makeup tips, so I’m definitely not stereotyping the many beautiful eyes of Asians. 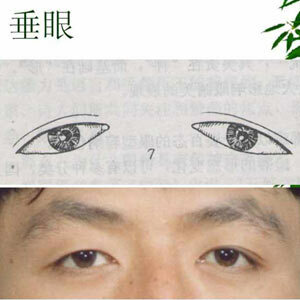 I used the above picture because it shows more obviously the beautiful, smooth skin on the eyelid of most Asians, and that the Orbital Rim does not coincide with the Fold(Crease, in Caucasian terms). 3 Asian beauties, just because. Where Is My Contour Area? In another tutorial, I already showed a simple method of how to locate theContour Area, and that it is clearly apart from the Crease or Fold. For most Asians, it can be hard to define the Contour Area just by looking straight into the mirror. Even when I look down into a mirror while keeping my head straight, I can barely locate the Contour Area. I need to raise my brows really high and be in a place with lots of shadows to locate it, and only just. The best way to find the Contour Area is simply to use a soft brush to GENTLY push the skin into the eye, and wherever the brush sinks into, is the Orbital Rim, which is what I refer to as the Contour Area. If you have Caucasian eyes, then you will absolutely no idea what I am talking about since your Crease = Contour Area. Haha. Why Define The Contour Area? I find that Orbital Rim and Socket Line explain it more accurately. From its many names, you can guess that it is the area where a transit color is generally placed to diffuse strong colors on the Lid, so that it looks naturally faded into the Brow Bone Highlight. The Contour Area can be further divided into horizontal or vertical thirds. Typically, the more colors you have, the more dimension the look will have, provided blending is executed well. Why Is It Called The Contour Area? As with some of the terms I use, like ‘Vertical Gradient Method’ and ‘Horizontal Gradient Method’, the ‘Contour Area’ is not an official term. I sorta came up with it because Orbital Rim and Socket Line sound very… um, anatomical. They don’t quite sound quite as pretty as Contour Area. Lol. I named it Contour Area instead of Contour Line because, especially on Asian eyes where the Socket Line is above the Fold, any line drawn on the Socket Line is going to look very unnatural, and may even look like an eyeliner smudge.Horror! That’s why the line should be extended into an area, blended out. How to Define the Contour Area? For people whose Orbital Rim is way above the Fold, don’t worry, you still can create depth to your eyes! You want to define the Contour Area to create more deep set eyes, but you don’t want to leave a harsh line there. 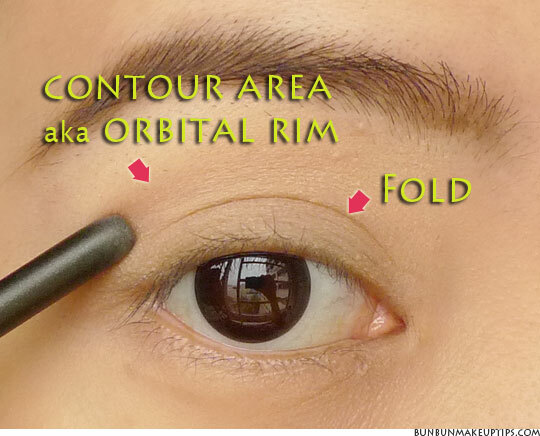 Apply the eyeshadow color of your choice at the Orbital Rim with an eyeshadow brush. The e.l.f Contour Brush and Stage Shadow Smudger worked fine for me, in fact I liked them a little more in the Contour Area than the MAC 219 just because the 219 is so precise it can be a little hard to blend out afterwards. 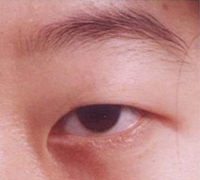 A badly blended line will look even more obvious on an Asian eye because the Foldis way below the Orbital Rim. I reserve the 219 for the Outer V.
Then, use the MAC 217 Blending Brush to blend out the line created. The Essence of Beauty Duo Crease Brush set is a new favorite of mine! I use 2 eyeshadow brushes for the Contour Area because the 217 is a little too large and too fluffy for me to be used directly to create the Contour Area. If you have really large eyes and wide space between your eyes and brows like Marlena from MUG, then by all means, go ahead and use the 217. Bun Bun’s Makeup Tip: If you’re not familiar with defining the Contour Area yet, try first with brown, neutral shades. They’re more forgivable. I like to apply a warmer color first (like orange or warm pink, warm brown) on theContour Area, followed by a darker color nearer down, and then define the Outer V. I also go back and forth on blending whenever I add a new color to eliminate any harsh lines. I know it sounds like a lot of steps and work just to create depth to the eyes, but it really takes no longer than a couple of minutes. In fact, using the right type of brush saves you more time. Just imagine drinking soup with a tea stirrer versus a soup soon. At the end of the day, both allow you to drink the soup, but the soup spoon gets the job done more quickly and you experience less frustration with it. Actually I did an Outer V for this, but it’s so small it’s not visible from this angle. I like that the Contour Area is very obvious here. I did a tutorial for this eye makeup look! And here’s the review of Stage Cosmetics. 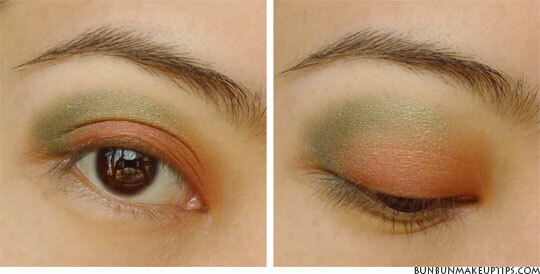 Haven’t blogged for a week coz I’ve been working on a series called Eyeshadow Tutorials for Asian Eyes. Man! It was a lot of work but I’m really pleased with the outcome. I hope this series can help more Asians better understand their eye shape and those who have Asian clients! In this 1st installment of the Eyeshadow Tutorials for Asian Eyes series, we take a look at where to place eye makeup on the Asian eye. When I first started out, I had no idea where or how to place eyeshadow. My eye makeup efforts were previously limited to eyeliner and mascara and sometimes, just a light dab of ONE eyeshadow color. When I purchased my first eyeshadow quad, I was lost. I had no idea the eye could be divided into so many parts – lid, crease, contour, highlight, etc. I had no idea that there are so many ways to shape the eye, combine colors, or use colors to emphasize or recede certain parts of the eye. Google and Youtube, of course, presented me with tutorials and eye charts from their wealth of resources, but most of them were limited to the Caucasian eye. It took me quite long to understand that I cannot copy the Western way of applying eyeshadow because one of the most prominent differences between an Asian and Caucasian eye is the ‘crease’, or rather, lack of. 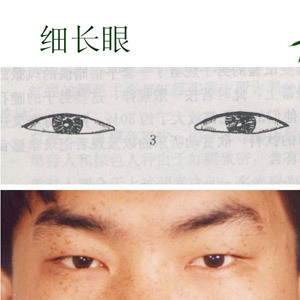 If you haven’t already checked out my post on the differences between the Caucasian and Asian eye, please do. It will definitely help you understand this post better too! 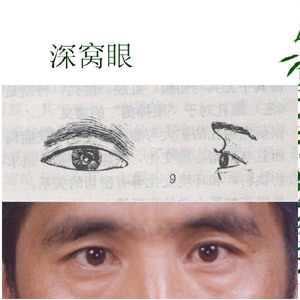 You would realize by now, if you have read the post mentioned above, that while the Crease of the Caucasian eye coincides with the Orbital Rim, theCrease of the Asian eye merely defines the Fold of the eyelid. 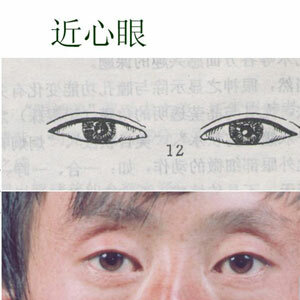 If you have aFold, it means you have double eyelids – prominent or hooded. 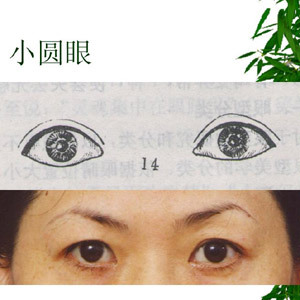 It is the fact that the Orbital Rim and Fold of the eye do not overlap that characterizes the Asian eye, and not the stereotypical slanted eye shape. In half of the world’s Asian population, there is complete absence of a Fold. 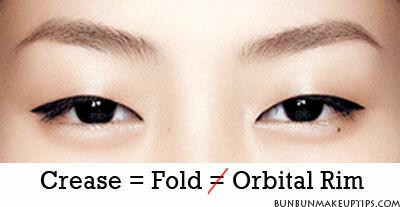 For the remaining half who possess a Fold, the Fold commonly does not coincide with the Orbital Rim. I am very proud to be Asian, and it is my wish to help as many girls out there to understand the Asian eye better and apply the most flattering eye makeup for their own eye shape and contour. Here is, finally, my own eye shadow placement chart to share with Asians who want to understand how and where to apply eye makeup better. 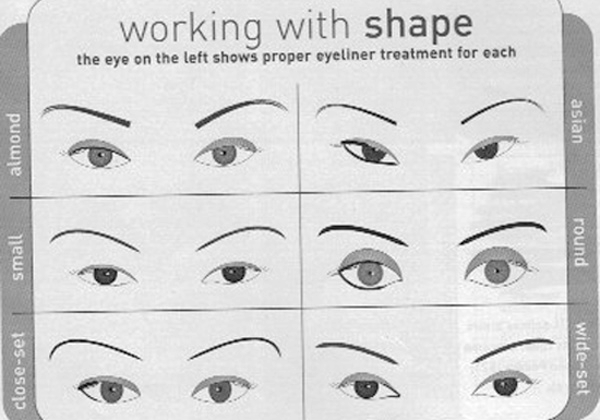 This chart would also be useful to help makeup artists understand how eye makeup looks can be better applied on Asians. 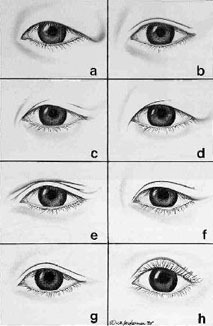 The chart is based on my own eye – large, round, with prominent double eyelids, and does not coincide with the Contour Area. I throw in tips for monolids and hooded lids as well! The placement of eyeshadows can vary for different looks, but here is the basic breakdown of parts of the eye. 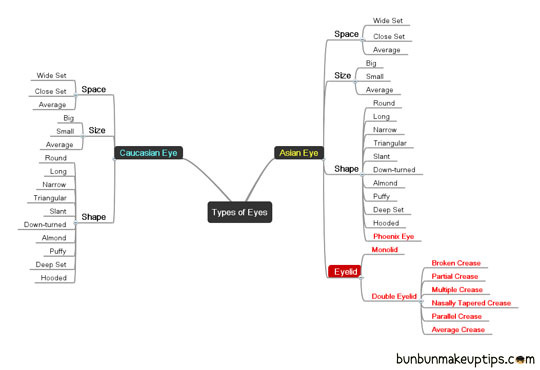 I included pictures for every part of the eye instead of having just one complete picture with all the different parts outlined, simply because I always find it troublesome to read and refer to only one picture at the top all the time. Took me many hours to draw the outlines, but the result is definitely worth the effort. I’m sure you will find it more straightforward to understand too! While the Lid can be covered in just one eyeshadow color, it can also be divided it into vertical halves – inner 1/2, outer 1/2; or thirds – inner 1/3, middle 1/3 and outer 1/3. 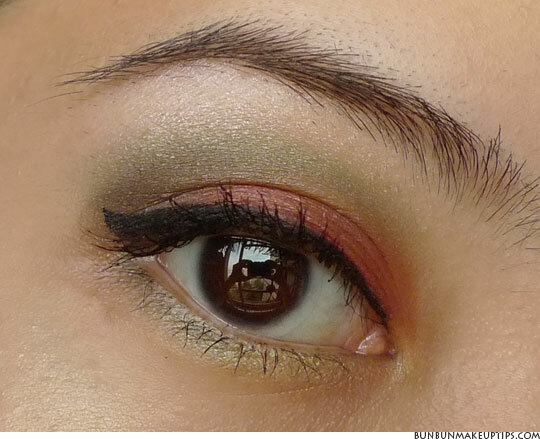 The first eye makeup look in this tutorial shows exactly that. The inner 1/3 of the Lid spans from the inner section of the eye to the edge of the iris. A lighter color compared to the middle and outer colors is usually placed here. The middle 1/3 of the Lid is directly above the iris. A darker color than the inner 1/3, but lighter than the outer 1/3 is usually placed here. The outer 1/3 of the Lid covers the edge of the iris to the outer edge of the eye. The darkest color of the lot is usually placed here. Note that I used ‘usually placed here’ for all thirds. 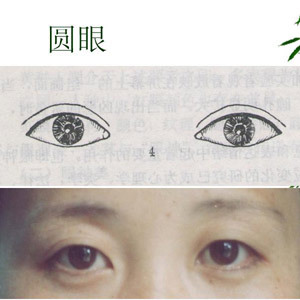 Firstly, the 3 colors can be of equal color strength, and secondly, the vertical division method is not as often employed on the Asian eye. For many Asians, the Lid area can be rather small, and some may not have aFold at all. 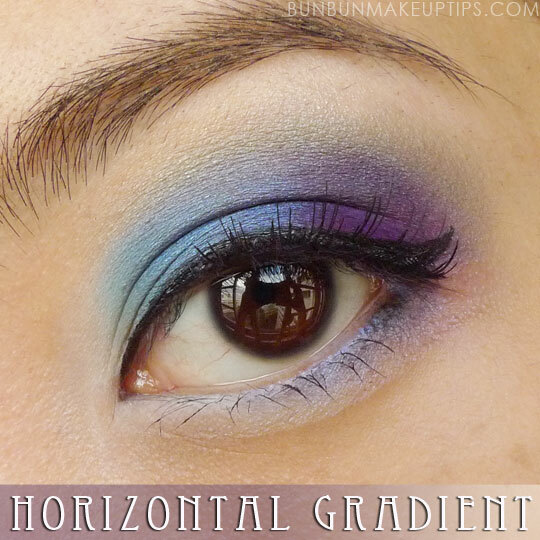 In most Asian eye makeup, the Vertical Gradient Method, which involves applying eyeshadow horizontally across the Lid so that a vertical gradient is formed, is ideal. Confusing much? 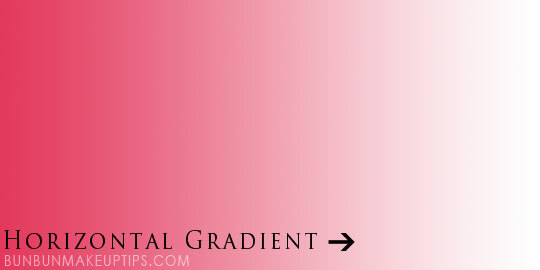 Check out this post to understand the difference between Vertical and Horizontal gradients. 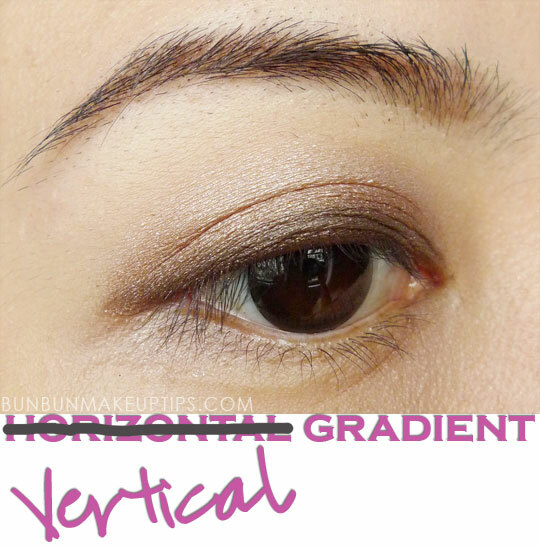 The Vertical Gradient Method will be discussed in the 2nd installment, andHorizontal Gradient Method in the 5th installment, of the Eye Makeup Tutorial for Asian Eyes series. The Inner Corner is the small area that points towards the nose. 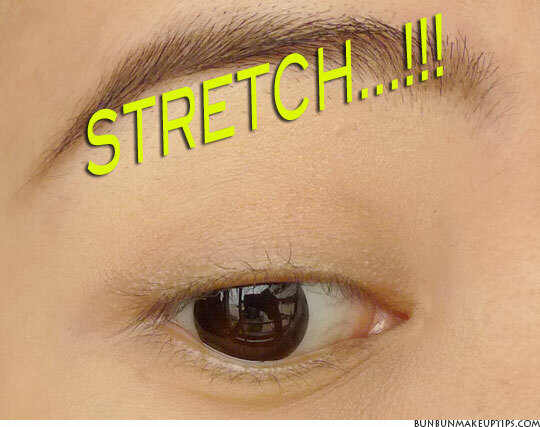 It can be expanded a little onto the inner 1/3 of the lid and also the the inner 1/3 of the lower lashline. 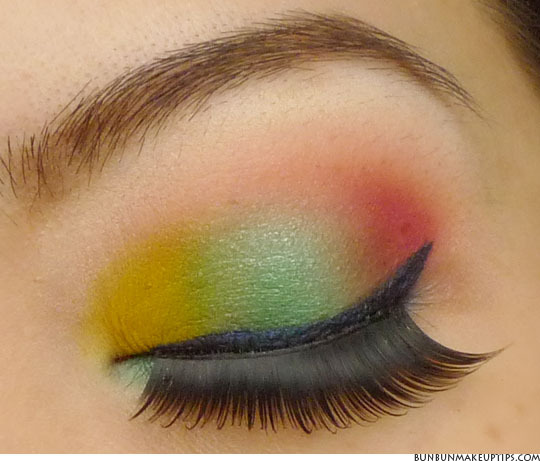 A little highlight color at the Inner Corner of the eye does wonders to make the eyes look brighter and more awake. I like to use MAC Eye Kohl in Fascinating or NYX Jumbo Pencil in Milk as a base, then layer with a light eyeshadow color like silver, beige, while, pink. 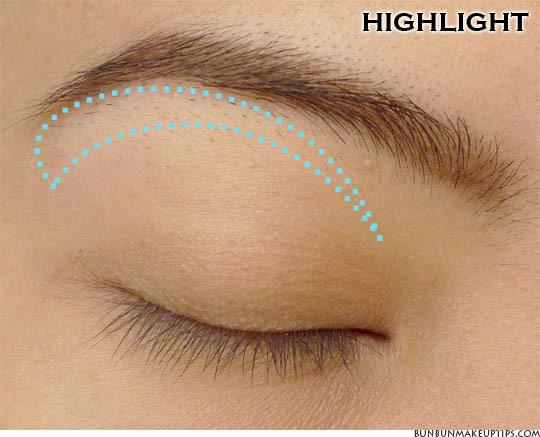 In Caucasian eye makeup talk, the crease is the line of indentation right above the lid, where the Lid folds. 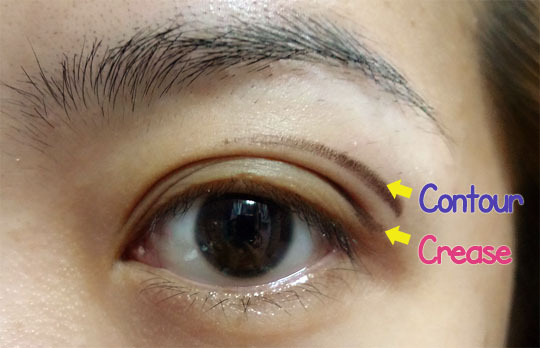 That indentation below the brow bone marks the natural Crease, and it is further emphasized by using a deeper eyeshadow color to create depth in the eye. The Crease of the Caucasian eye typically coincides with the Orbital Rim. 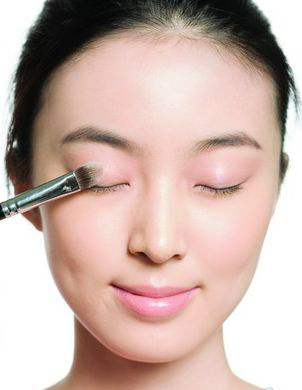 For Asians, if the Crease is defined by where the lid folds, then placing a deeper color at the crease will only serve to make the eyes look smaller, especially if you have heavily hooded eyelids, or a very small lid area. 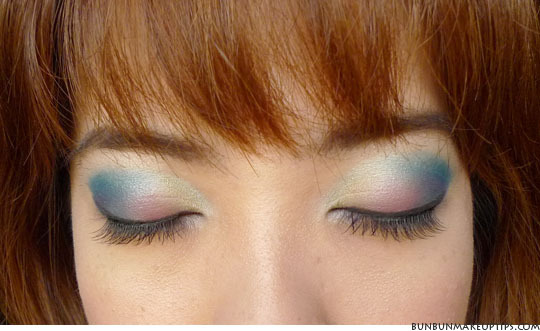 Check out the different types of Asian eyes and appropriate makeup! 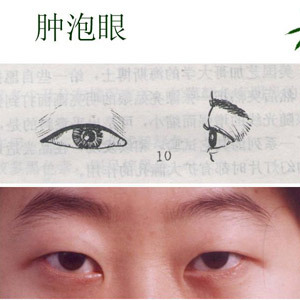 The Crease of the Asian eye typically does NOT coincide with the Orbital Rim. For all my tutorials, I rarely use the term ‘Crease’, because that would be confusing to many Asians, and ‘Crease’ really means ‘Fold’ to me. If I need to state that eyeshadow color must be placed ‘at/above the Crease’, I will simply say that it needs to be placed ‘at/above the Fold’. More explanation will be done in the 4th installment of this Eye Makeup Tutorial for Asian Eyes series – Defining the Contour Area. I like to use Contour Area and Orbital Rim interchangeably. 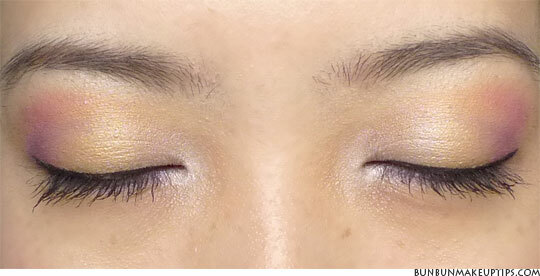 A transition color is usually placed at the Contour Area, to transit from the eyelid color to the brow bone highlight. One color can be used as a transit color on the Contour Area, but it can also be divided into a gradual transition of colors, moving towards the brow bone. For Asians, there is no clear indication (just by looking) of where the Contour Area is exactly, unlike in the Caucasian eye where the Crease is at the Orbital Rim. In that case, you want to apply the transition color at the Orbital Rim, and blend the color out so that there won’t be an artificial-looking line sitting on an unseen indentation. Therefore, instead of trying to fake a Crease that isn’t there (like if you have a low Fold or none at all), ignore the Fold and transfer your energy to work on theContour Area. By sweeping eyeshadow above the Fold onto the Contour Area, you bring instant lift to the eyes and enhance the shape of the eye area. If this is not clear yet, an entire tutorial on Defining the Contour Area will be covered in the 4th installment of this Eye Makeup Tutorial for Asian Eyes series. 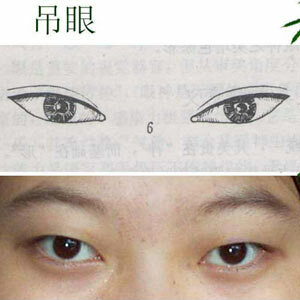 As if it is not already hard enough to locate the Outer V on the Caucasian eye, the lack of overlapping of the Crease and Contour Area on the Asian eye makes the task even more daunting. To start, imagine a line extended out from the Lower Lash Line, but not beyond the Border (to be covered in a while). That is one stroke of the ‘V’. In Caucasian eye makeup talk, the other stroke of the ‘V’ is found on the ‘Crease’. Easy. The Outer V is also called the Outer Crease, because it really lands on their Crease. But I prefer not to use the word ‘Crease’ for the Asian eye to eliminate confusion. Since we Asians cannot use the ‘Crease’ as an easy way out, the other stroke of the ‘V’ is usually found sitting on the Orbital Rim. You can see from the diagram above that the upper stroke is above the Fold. This will be the case for most Asians. 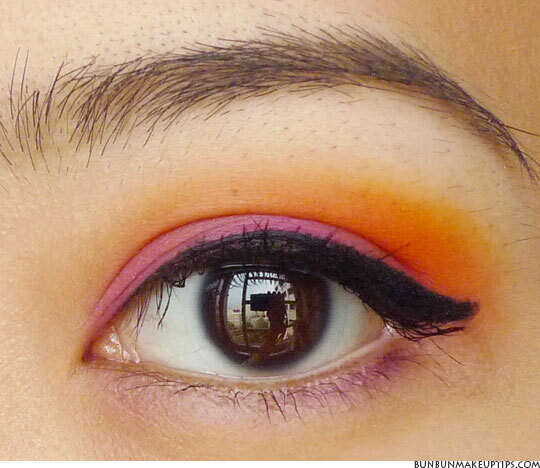 Again, you want to blend the Outer V out well so that it does not look too unnatural on the Asian Eye. Placing a dark color on the Outer V creates shadows and brings more depth to the eye. Because there is much more to discuss on the topic of the Outer V, a tutorial onDefining the Outer V will be covered in the 3rd instalment of the Eye Makeup Tutorial for Asian Eyes series. Kinda heavy, isn’t it, the top parts? 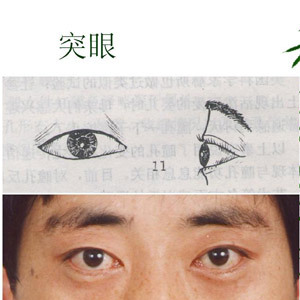 Now what’s left are the easy parts, because there are no obvious differences for these parts between the Asian and Caucasian eye. The Highlight area is directly below the brow, and a light or bright shade like white, beige, silver, is placed here to make it stand out when light hits the face. This area can be larger or smaller than the area I circled on my eye. My favoriteHighlight colors are Shroom from MAC and Tequila from Kat Von D Beethoven Palette. Oh, one little difference I need to mention between Asian and Caucasian eyes is that the brow bone highlight will look more noticeable on the Caucasian eye because of a more pronounced brow ridge. The Upper Lash Line is where you apply eyeliner. This must be the most understood area of the eye. Haha! Gel eyeliners work best on my oily eyelids because the pigmentation is great, long-lasting and does not smudge. My favorite gel liner is the Kate Gel Liner in BK-1. I like Bobbi Brown Gel Liner in Black Ink too. 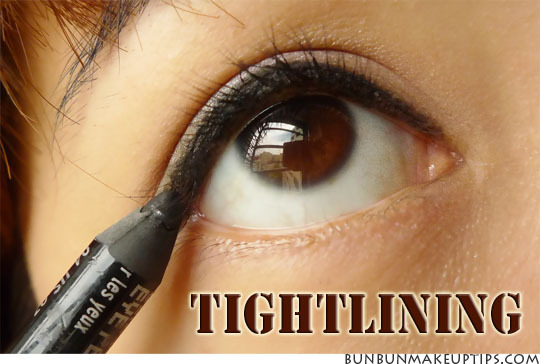 Also apply eyeliner as close to the Upper Lash Line as possible. Follow up with Tightlining the Waterline. This is also where false eyelashes should be applied, as close to the Upper Lash Line as possible. Done with the upper part of the eye! YAY! You can have great fun with the Lower Lash Line! Just like the Lid and Upper Lash Line, the Lower Lash Line can be divided into inner, middle, and outer. If you divided the Lid into vertical thirds, you can follow the exact order in which the three eyeshadow colors were placed. 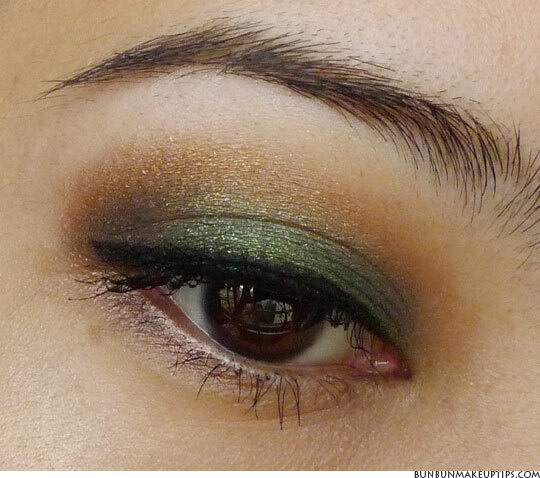 Alternatively, you can simply use dark eyeshadow colors to create a smokey look. Smaller eyes should avoid using black or dark brown all along the Lower Lash Line as these colors on the Lower Lash Line tend to make the eyes look smaller. A dark color can be used on the outer 1/3 of the Lower Lash Line, a mid tone on the middle, and a lighter color on the inner 1/3. Some people use eyeliners on the Lower Lash Line, but since I am allergic to anything but eyeshadows there, I don’t use eyeliner in any form. It is definitely alright not to put anything on the Lower Lash Line as well, but I prefer to apply a color or two for balance and dramatic definition. I like to use Smog, which is a gorgeous bronzey brown from the Urban Decay Naked Palette, on most occasions when I want some color there, but nothing too OTT. 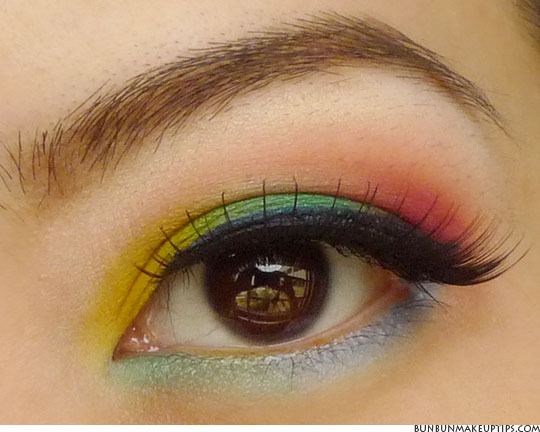 I love having colors on the Lower Lash Line too! 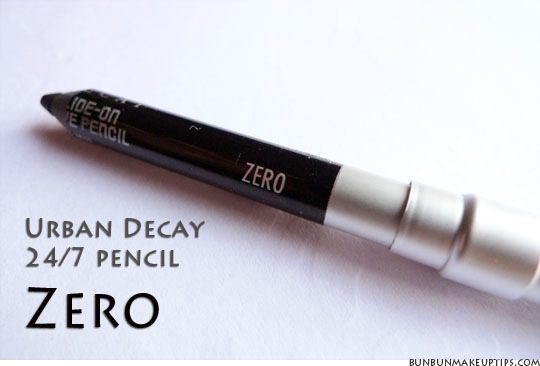 Use a pencil brush like the MAC 219 for precise placement of eyeshadow on theLower Lash Line. The Waterline is the watery area that is close to the eyeball. There are two – the upper and lower. The Upper Waterline is where Tightlining is done – a method used to give the illusion of thicker eyelashes with the use of a black (typically) eyeliner. 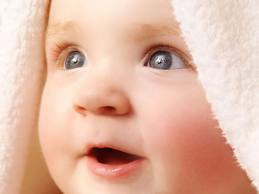 On the Lower Waterline, some people use beige, white, silver to make the eyes appear bigger by visually extending the area. Or black, to give that dark look, but unless you have large eyes that won’t get compromised by black, try not to rim the entire eye with black liner. I love Tightlining my Upper Waterline, but nothing stays or works on my Lower Waterline. After realizing that I am allergic to eyeliners on my Lower Waterline,especially eyeliners with shimmer, I don’t touch it anymore. So no good stuff on the Lower Waterline for me, can only play with the Lower Lash Line and only with eyeshadows. I mention the Border here to show where eye makeup should not go beyond. An imaginary line can be drawn from the edge of the Outer Lower Lash Line towards the edge of the brow. Normally, no color or line is place on or beyond the Border, unless an artsy look is intended – some people place rhinestones or draw dots at the border or extend eyeshadow way beyond the line. While it is important to keep regular or even dramatic eye makeup within that zone, don’t go draw a harsh line along the border or abruptly stop there. Remember to diffuse any color so that it looks naturally faded out. Hey guys! I’m so happy the first installment of this series (Where to Apply Eyeshadow) was so well received! Thank you all for your support! In the second installment of the Eyeshadow Tutorials for Asian Eyes series, we discuss the Vertical Gradient Method of eyeshadow application. The Vertical Gradient Method is widely used on Asian models I often see in Japanese, Taiwanese, or any other magazines that showcase Asian models. While there are no rules when it comes to makeup, the Vertical Gradient Method is one easy method of eye makeup application, and looks great on people with limited lid space, have heavily hooded eyelids, or have monolids. The Vertical Gradient Method is basically dividing the lid horizontally, most commonly into 3 sections and with the darkest color placed nearest to the eyelashes. In my opinion, why the Vertical Gradient Method is not as popular among Caucasians is because having just one color on the bigger lid space will not bring out the contours of the Caucasian eye as much as having more colors and defining their Crease. On the other hand, the Vertical Gradient Method looks polished andsophisticated on many Asians because the lower position of the Fold and non-coincidence with the Orbital Rim creates a smooth canvas for color gradation. 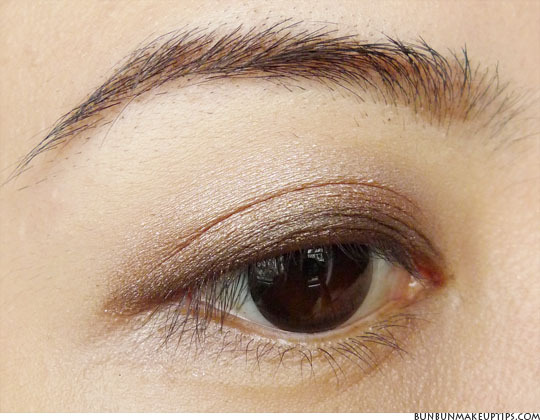 Monolids or heavy hooded lids will benefit the most from this eyeshadow application method. Because I have slightly more prominent double eyelids, this look is quite not as optimal on me as compared to a person with monolids or with a lower Fold. It must be the existence of the Fold that causes interruption to the beautiful gradation of colors. It is because of my eye shape that I find it necessary to define the Outer-V andContour Area to make my eyes look more defined and dimensional. The Outer Vand Contour Area will be covered in the third and fourth parts of this series respectively. Using multiple shades of color of the same family builds dimension and definition. For this look, I used Sin (light champagne), Smog (bronzey brown) and Darkhorse (dark brown) from the Urban Decay Naked Palette. Now let’s go through together the simple steps of the Vertical Gradient Method! 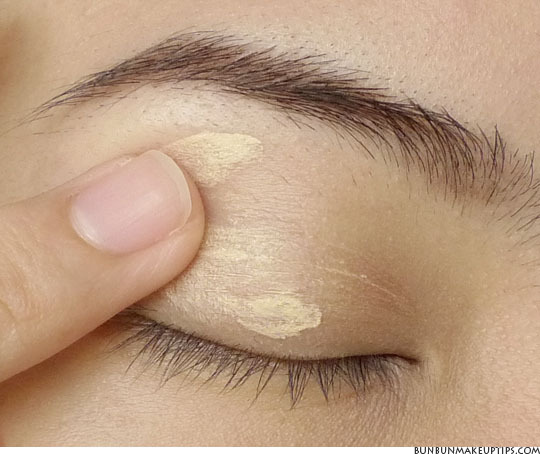 As with all eye makeup, make sure that the eye area is free of oils and water. 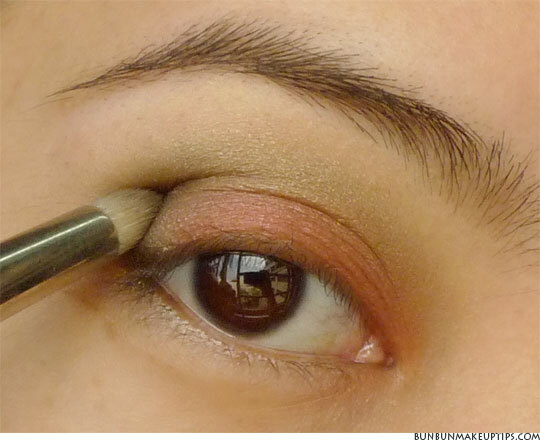 Then apply an eye primer to prolong eyeshadow lasting power and bring out the vibrancy in them. Having an eye primer on is especially important for people with oily eyelids like myself. Without a primer, even MAC, Urban Decay and Sugarpill eyeshadows tend to fade like nobody’s business by mid day on my eyes. Apply the lightest color (Sin) on the entire eyelid area. Don’t stop beneath the fold – go ABOVE it instead, especially if your eyelid fold is very low. Now use a darker color than the first (Smog) and apply it from the lashes upwards, stopping just slightly below the first color (Sin). Now you have 2 colors on the lids and it is most important that they don’t look like 2 blocks of colors. With neutral colors such as browns, bronzes, and pinks, blending is a lot easier than say, loud bright eyeshadow colors that are of a different color family. Take the darkest color of the 3 (Darkhorse) and place it nearest to the lashline, almost using it as a guideline for the ensuing eyeliner. You can see from the picture on the right the gradation of 3 colors. If I didn’t have such a thick eyelid fold, the picture on the left would reflect well the 3 colors too. You may also do it the other way round – applying the darkest color near the lash line first, and then work your way up in a gradient, ending with a highlight color under the brow. I guess this is how it will look like if I didn’t have double eyelids (looking down so that the crease is not visible). That’s why people with monolids or heavy hooded lids can totally rock this look. Blending is key here. You want a natural progression of colors, not blocks of colors (unless that is your intention, like Color Blocking), nor a muddy mess of brown. 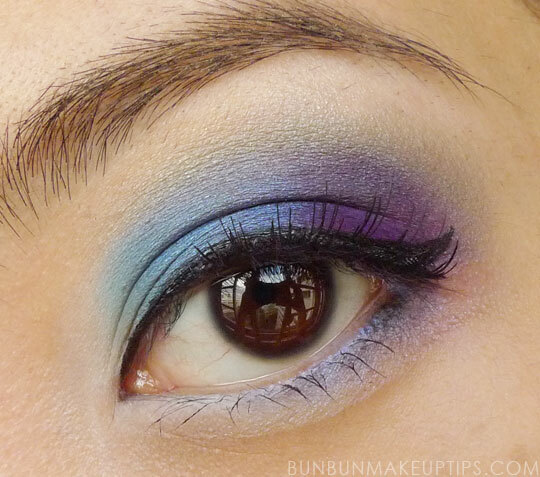 Bun Bun Eyeshadow Blending Tips: By ‘blending’, it means to blur the intersection of 2 colors, not the whole 2 areas. There must not be a definite start and end to each color. It’s like you can see it, but can hardly put a finger to where the start and end points are. I prefer using makeup brushes, but sponge applicators can definitely do the job for the Vertical Gradient Method. Complete the look with eyeliner and mascara! 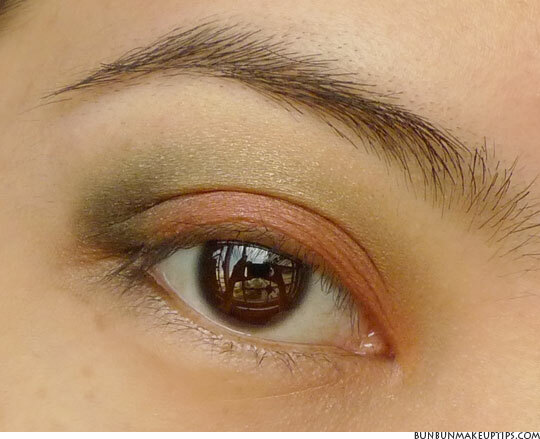 Remember in the first tutorial for this series I mentioned the Inner Corner of the eye? Yup! I highlighted the Inner Corner of one eye with Sin. 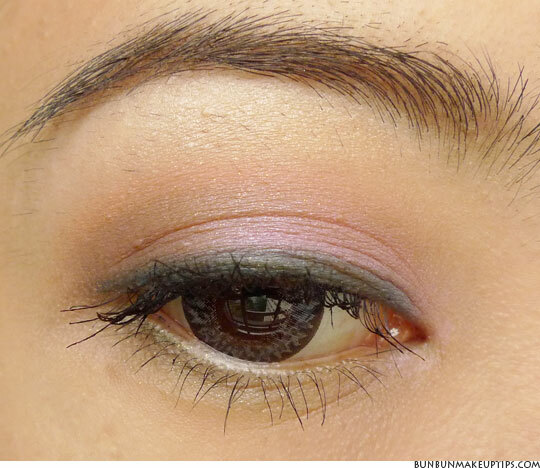 See how a little spot of light eyeshadow brings light to the eyes? =D You should try it! Gradients don’t have to be boring or limited to browns and neutrals. I, for one, am more of a COLORS fan. LOL. 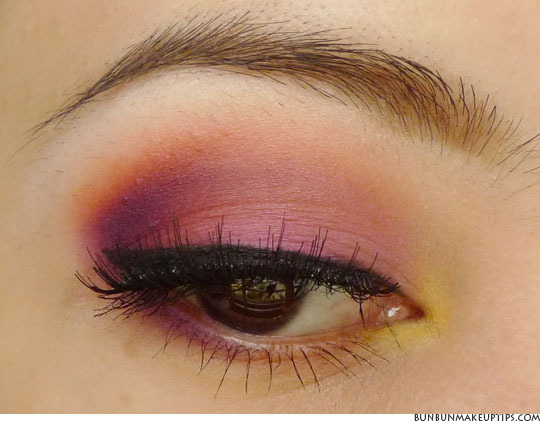 I love to use purples, blues, reds, greens, oranges, yellows, pinks to bring out my dark brown eyes. 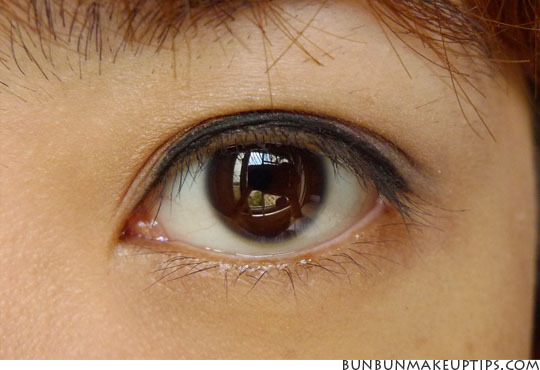 Browns tend to drown out my brown eyes, as mentioned in a post on the Bobbi Brown Gel Liner Chocolate Shimmer Ink. Shades of browns are nonetheless important in neutralizing or toning down colors, or to diffuse strong colors in theContour Area. Here are some looks I found in my stash of makeup looks that exhibit the Vertical Gradient Method. Somehow I never posted them as tutorials or makeup looks. Haha. I’ll put up tutorials if requested though! 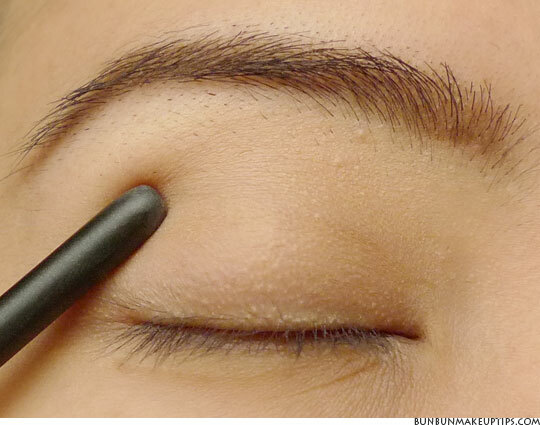 Makeup Tips: The shape of Slanted Eyes is quite the opposite of Down-turned Eyes. 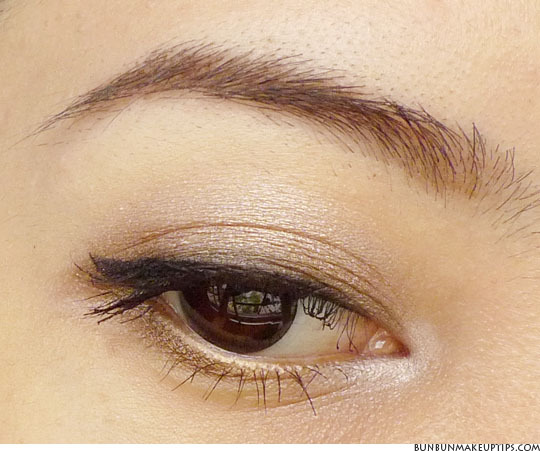 Take full advantage of the natural slant in the eye by winging out your eyeliner. 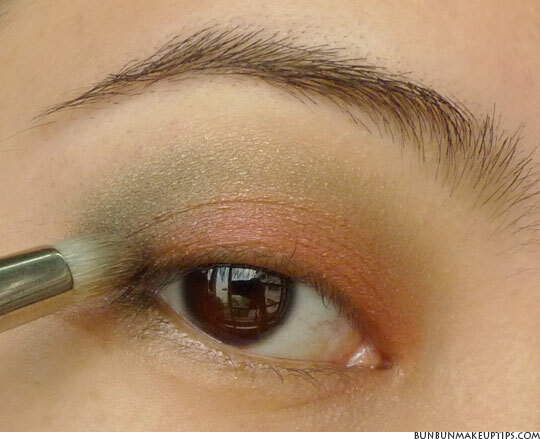 Or if you want downplay the slant, follow the tips for Phoenix eyes. But before I start explaining, here’s a little disclaimer. The words ‘Westerner’ and ‘Caucasian’ will be used interchangeably in this post with no intention whatsoever to offend anyone. 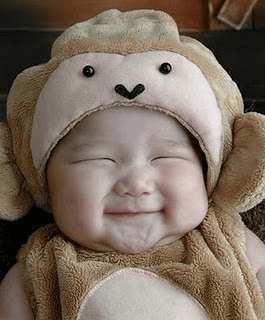 With ‘Asian’ I refer more specifically to East and Southeast Asians – Mongoloids (LOL! What a funky name!). Western Asians (Middle East) and Southern Asians (Pakistan, India, etc) have anatomical traits more similar to those of Westerners. So we shall only cover the Mongoloids of Asia. See what I mean? Just one ‘typical Caucasian eyelid crease’. 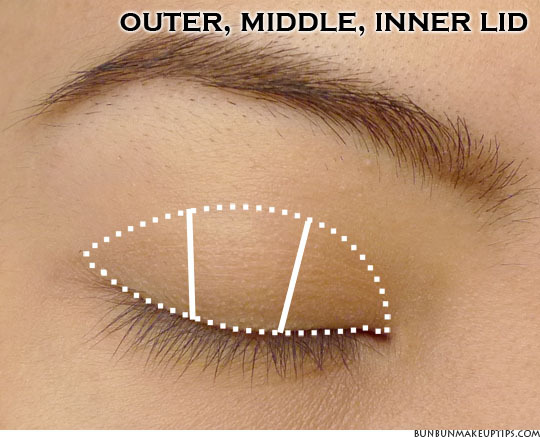 I can totally relate to these eyes and know how to apply makeup on them while a Caucasian upon seeing this chart may be perplexed that an eye can have no crease or that theorbital rim (contour area) is nowhere near the crease. 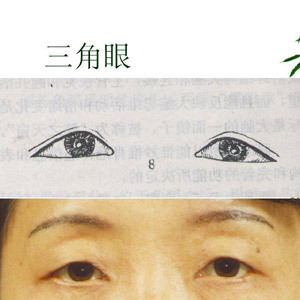 While most makeup artists learn from the standard charts such as those above, I think it is high time that more artists realize there is more to a standard ‘Asian eye’ than a slant, epicanthal folds, and monolids (or high crease as in the Eye Chart #1). Beauty bloggers who do a great job with eyeshadow tutorials for Asian eyes are Jen (from Korea) frmheadtotoe, Connie (from Malaysia) skindeco, and Nikki (Philippines) askmewhats.